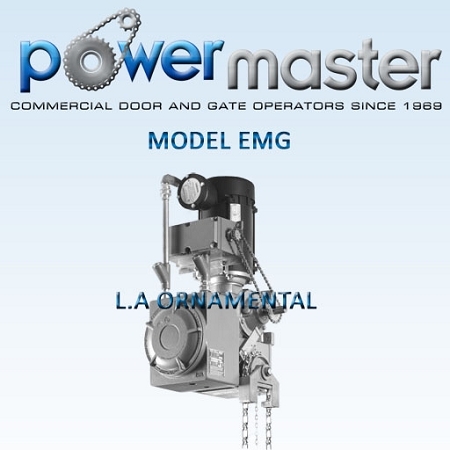 PowerMaster Model EMG operators are designed for use on Sectional Doors with High Lift or Vertical Lift and Rolling Service Doors and Grilles in NEMA 7&9 Hazardous Locations. Supply PowerMaster model "EMG" Industrial Duty Hoist type operator rated HP,VOLTS, PHASE, for use on Sectional Doors with High Lift or Vertical Lift and Rolling Service Doors and Grilles in NEMA 7&9 Hazardous Locations. Primary speed reduction shall be by means of an industrial gear box with bronze worm gear in an oil bath. Motor shall be of the high starting torque, continuous duty industrial type, protected from overload by a current sensing or thermal type overload device. Motor controller shall be a heavy duty, full voltage, across the line, magnetic reversing contactor, that is mechanically and electrically interlocked. Electrical components shall be installed in a NEMA 7&9 enclosure integral to the operator. A transformer shall be provided to reduce control voltage to 24 VAC. Separate terminal strips shall be provided for connection of power supply line and all control devices. Operator shall be wired for an open/close/stop control station. Control circuit shall provide instant reverse motor wiring on 1Ø operators. Positive chain driven, rotary type limit switches shall be provided to limit full open and close travel of door. Limit switch adjustment shall not be affected by removal of motor or by manual operation of door. A floor level manual hoist chain shall be provided for emergency operation of door. An electrical interlock switch shall be provided to disable control circuit while manual hoist chain is engaged. Final drive chain shall be a #50 or larger roller chain. Operator shall be capable of right or left hand mounting in either a vertical or horizontal position.